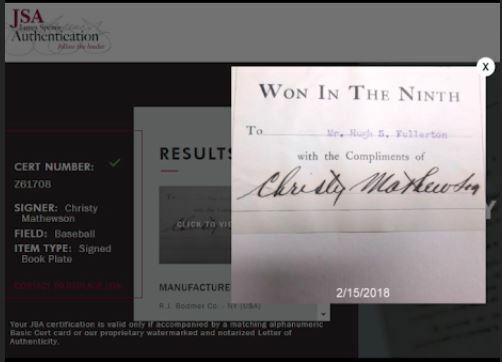 (Scroll to bottom for Update) Throughout the past few decades, astute dealers and knowledgeable collectors alike have surmised that the alleged autographed copies of Christy Mathewson’s 1910 book, Won in the Ninth, were not actually signed by the Hall of Fame pitcher, but rather by a secretary. The issue came to a head in 2004 when author Ron Keurajian took issue with the signatures in an SCD article and in 2005 when a copy of the book was offered at Sotheby’s and became the subject of a news report in the New York Daily News. As a result of the controversy, Sotheby’s removed the problematic lot from the auction even though it had sold three months earlier in an R&R auction for $10,655.19. For some in the hobby, Keurajian’s analysis was the final nail in the coffin for the bogus signatures found within the Matty books. But this, however, was not the case for the TPA’s like PSA/DNA and JSA who had for years been generating LOAs for scores of Matty books sold for big bucks via their auction house clients. The TPAs, including James Spence Jr., ignored Keurajian’s analysis and further denied the evidence illustrating that the Matty signatures were bogus including the “Case Against Matty’s Won in the Ninth“ investigative reports published in 2011 by Hauls of Shame. (JSA has also been exposed by HOS in reports illustrating how Spence has certified many fake Matty single signed baseballs as genuine.) 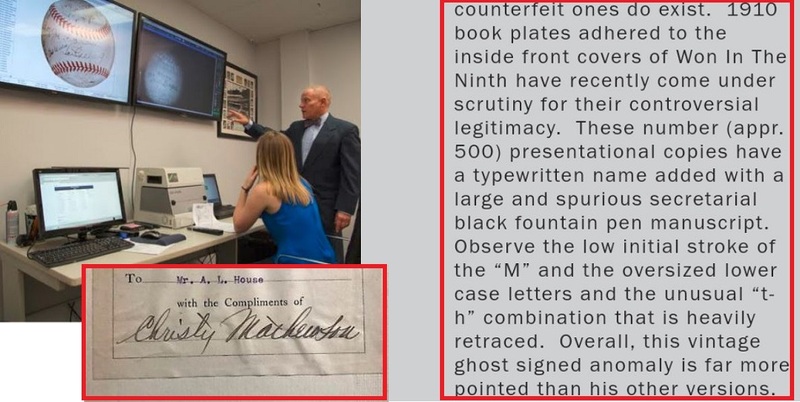 Despite all of the evidence illustrating that the Matty signed book-plates are fakes, some collectors continued to buy them as evidenced by a May 2017 sale by Huggins & Scott for $7,000. But although Spence made this public admission, which he had previously fought for years, he has continued to issue fraudulent LOAs for the non-genuine Matty book-plates. Case in point is an LOA he issued for dealer Steve Wolter in February of 2018 for one of the bogus Matty signatures. Wolter, like other dealers who have paid for fraudulent LOAs, offered the book for $9,500 on eBay with the certification signed by James Spence Jr.
Spence signed a fraudulent LOA for a bogus Matty signature on February 15, 2018 (left); Other copies accompanied by fraudulent JSA LOAs keep appearing for sale on eBay (right) and at major auction houses. That copy went unsold on eBay along with another specimen which was posted this past summer. Wolter’s book, however, reappeared in a Steiner Sports auction accompanied by the JSA LOA issued after Spence’s public admission. That bogus copy of the book received 25 bids and sold for $10,760.40 on May 6, 2018. The JSA website shows that Jimmy Spence issued this certificate numbered "Z61708" on February 15, 2018, several months after he admitted the Matty signatures were bogus. Spence’s company website also shows this fraudulent LOA they issued with a certification number of “Z61708″ and the date of February 15, 2018, several months after Spence identified the Matty signatures as fakes. Adding to the controversy are additional copies featuring the bogus signature which continue to appear at auction with JSA letters of authenticity. It appears that Spence has either not informed his auction house clients or has conspired with them to continue selling the fraudulently authenticated autographs to the general public. The most recent appearance of a problematic Mathewson book accompanied by a fraudulent JSA LOA is in the current Goldin Auction as lot number 199. The LOA for the book numbered “346″ is signed by Spence and is dated September 26, 2014. The lot currently has a bid of $4,000 and appears to be the same copy that went unsold for $12,500 on eBay this past summer. Self proclaimed expert James Spence (left) admits that the Matty signed book plates (inset) are fakes on his JSA website (right). James Spence Jr. claims on his website that he “has built a world wide reputation as the premier autograph authenticator in the world.” Spence’s claims have been bolstered by the sports auction houses and other outlets like eBay which endorse and in some cases pay for his services. These associations have deceptively bolstered his credibility in the industry. Spence’s profile was first boosted by disgraced auctioneer and convicted felon Bill Mastro who did the same when he elevated Spence’s status as the primary authenticator for Mastro Auctions and PSA/DNA between 1998 to 2002. Spence also makes claims that his services are used by the FBI, IRS and the U. S. Postal Service, however, sources affiliated with the FBI have confirmed several times over the past few years that Spence has been the subject of on-going investigations into the third-party authentication business. In addition, Spence has lied about his lack of formal training claiming to have worked with the late autograph guru Charles Hamilton and has been implicated for stealing images of a specific collector’s items and intellectual property which he usurped for his own exemplar files. Spence also falsely claims that he has “an exemplar library which is second to none in the autograph industry.” Spence also claims to have 700,000 files of exemplars. It’s now safe to say his file on Christy Mathewson includes dozens upon dozens of forgeries from Won in the Ninth. 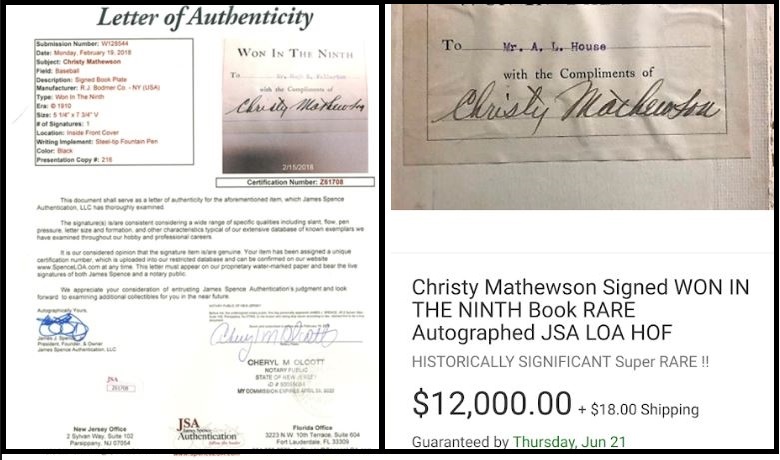 After Hauls of Shame published its report yesterday showing that James Spence Jr. and JSA had admitted that the Christy Mathewson signatures found on copies of the book Won in the Ninth are not genuine, that information appears to have been removed from the “In the News” section of the JSA company website. 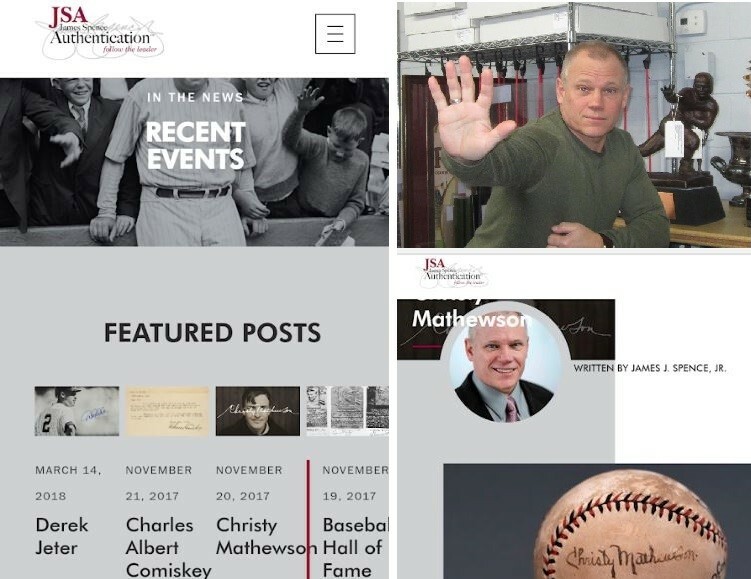 The original Mathewson blog post authored by Spence and published back in November of 2017 no longer exists among other featured articles in which Spence offers analysis of autographs of select Hall of Famers. The site still features his posts on Derek Jeter, Charles Comiskey, Earle Combs and others. Jimmy Spence removed from the JSA website his Nov. 2017 admission that Mathewson signed books are fakes. After HOS published an article yesterday exposing Spence, his entire analysis of Matty signatures has vanished. Shown above are screen shots of the Spence post before he removed it. According to one source, the Mathewson post was removed in such a fashion that not even the Wayback Machine could now recover it. All that appears now is a brief description of the original post when the subject is searched on Google. After its removal by Spence, the only evidence left of his admission on the Internet is this Google search result. Spence and JSA appear to be backtracking towards their original position in support of the many fraudulent LOAs they have issued in the past regarding the books with the bogus signatures. Ken Goldin of Goldin Auctions has still not responded with any answers from JSA and the bogus book still appears as lot 199 in the current Goldin sale. LOL anyone who collects rare “autographs” that are not from an original check is a moron. Like that Mufsud character and his phony “signed” T206s. It just keeps going on and on and folks keep getting duped everyday and is a shame. The FBI needs to have a talk with Mr. Spence. I always thought that if you know something is fraudulent, (and even put it in print that you know), and you still certify something as genuine and state that your opinion is that it is genuine, then that would be a fraudulent transaction. Brusokas needs to talk to this guy. Authenticators are not above the law and when it was the forensic document examiners in the 1990’s the feds moved in, why not now? It’s just as bad or worse. So Spence needs to explain himself, and we should not settle for an excuse like “it was a mistake”. He knows this bookplate as well as anyone and he could never certify it as genuine and sign off on it when he had put in print previously that he knows it is not authentic. Mr. Nash set the story straight on this subject 7 years ago. Everybody in the hobby reads Halls of Shame. Any auction house or tpa that facilitated a sale of won in the ninth since 2011 should be ashamed of themselves. As usual, the ownership of bogus and stolen sports memorabilia outed by Mr. Nash becomes a game of musical chairs where the hobby bigwigs dupe the unsuspecting public. Naturally, Goldin won’t yank the fake Mathewson item as he’s one of the biggest lowlifes in a hobby filled with them. Of course he’s also a Net 54 advertiser. I wonder if he’ll be an honored speaker at the next Net 54 dinner like John Rogers was? Some said so many of these plates were certified as genuine had to stay that way for fear of favored sellers having to make a refund. A wonderful story about these plates was published on http://www.autographplanet.com back on Jan. 25 and Feb. 1, 2018. It is refreshing to read an article about fraud in the hobby that does not include Leon. What a bunch of low life scumbag scam artists. Let me know if you need help to put them in jail. Leon’s claim that Nash is a criminal is probably based on Leon knowing what a criminal is as he’s got how many drug dealing convictions? So he went from dealing drugs to running a website with fraudsters as advertisers. Big leap there! Hey J.A … can’t a felon get a little love? 1) Pete Nash is a bad guy therefore everything he says is false, including that Spence has already claimed that the Matty book signatures are fake even though this is a direct quote from Spence. 2) Leon is not a bad guy even though he got arrested for selling drugs twice. Everything he says is true. 3) This logic has helped me run a successful video tape store. T206 Collector’s collection of little beauties and beautiful treasures are all fake. Yet he keeps trying convince anyone that 1-2 of his signed cards are authentic. What a dummy to think that anyone believes his ability to spot a fake when he missed 10 fakes in his collection. ALL FAKE!